« The Real Mexico? ¿Y cuál es ése? 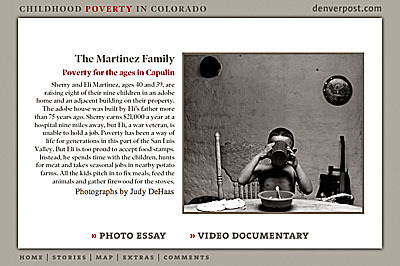 * Childhood Poverty in Colorado — The Denver Post’s owner may be recovering from bankruptcy, but the photography (and reporting) staff is hard at work. Wonderfully intimate and ultimately saddening images from variety of families. The splash page is above. * Ian Fisher: American Soldier — Photographer Craig Walker of the The Denver Post (again) follows the enlistment, war and homecoming of one soldier. Walker’s work also the Pulitzer this year for feature photography. 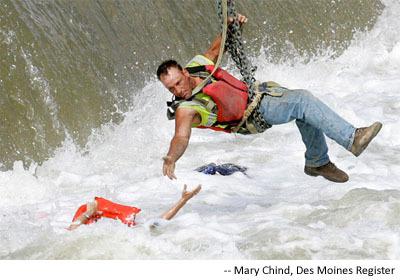 * The other photojournalism Pulitzer winner this year was Mary Chind, who shot the dramatic photo below of a construction hanging for a crain in order to rescue a drowning woman. Here’s the story behind the shot. This entry was posted in Grab Shots, Photojournalism and tagged , Craig Walker, Denver Post, Des Moines Register, Hillman, Hillman Foundation, Mary Chind, Media News, Photojournalism, Pulitizer.